One Christmas many years ago, I woke way too early and couldn’t fall back to sleep. I ended up watching British Christmas stories on Public Television. One stuck with me, The Mousehole Cat. It was the story of Mowzer, a cat, and of her fisherman, Tom. They lived in the Cornish fishing village of Mousehole, (pronounced Mowzal) named for its tiny harbor with a narrow mouth that hid the town’s small boats safely behind the rock wall. The vivid illustration was eye-catching and the narrated story told the curious tale of these two soul mates that sailed the sea together to bring back a daily catch of hake, ling, launces and fairmaids. 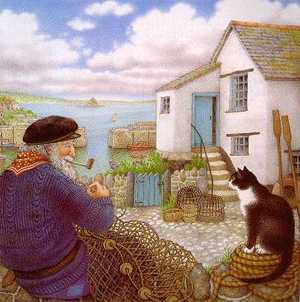 It portrayed a town life of community, animals, of sustenance from the sea, the cruelty of Mother Nature, and of love. At the end of the story the illustration dissolves into scenes of real life taking place in Mousehole during Christmas. It was inviting and if you’ve ever visited Cornwall, you’d appreciate everything you might think the season would look and feel like in this small, seaside town. I was hooked. The following Christmas my boyfriend’s parents, who live in England, gave me the book, The Mousehole Cat. A year later he took me to Mousehole and I felt like I was in the book. It was just as picturesque, inviting, and charming as it appeared in the story. 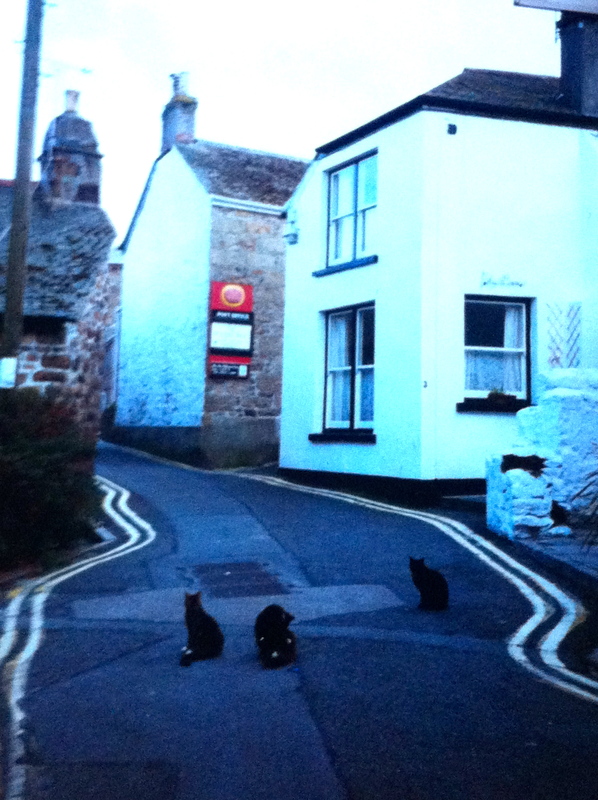 Mousehole is a hilly and curvy town with winding alleys and there were cats everywhere. Cats on cars, cat sitting all about the cobble-stoned lanes, cats in gardens, cats lounging in front of shops. We drove very slow. And there was also the mouse-hole shaped harbor, just like in the book. Such a safe and pretty harbor. We booked into an inn that looked out over the harbor where colorful fishing boats bobbed about. Then we freshened up and strolled the town. Us Americans seem to fall easily for the quaintness of English culture and here I was surrounded by it. My guy, born and raised across the pond, seemed to get a kick out my enthusiasm. Seeing as how he’d never been to this part of Cornwall, he gave into the magic of it all as well. At a small café we enjoyed Cornish pasties and, even though I didn’t need them, afterwards I stuffed my face with fresh cream and scones. We popped into a few local art galleries and passed gardens exploding with flora and fauna typically seen in warmer zones. Stone cottages with flower boxes overflowing with bright purple petunias, scarlet million bells, and host of other bright petals in various hues of blues and yellows were inviting. The cliff walk welcomed us with briny air and a carpet of wildflowers. 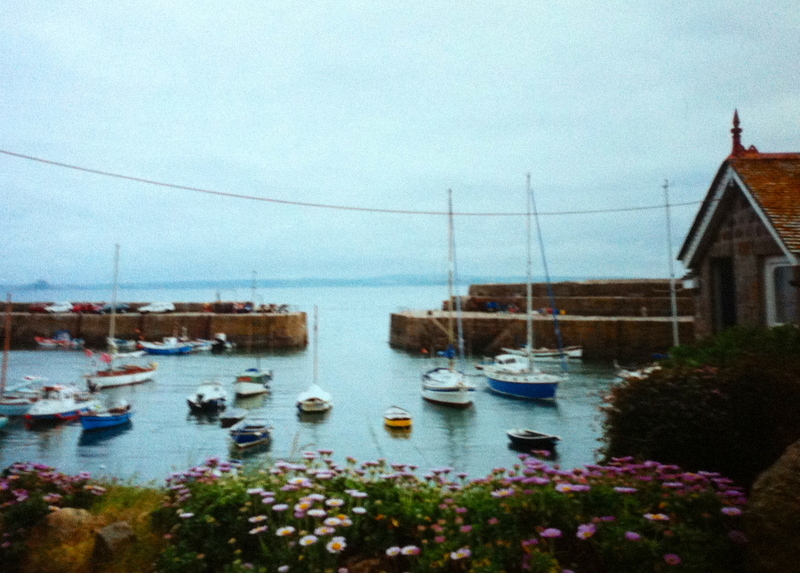 Mousehole is designated an “Area Of Outstanding National Beauty” by the British National Trust. 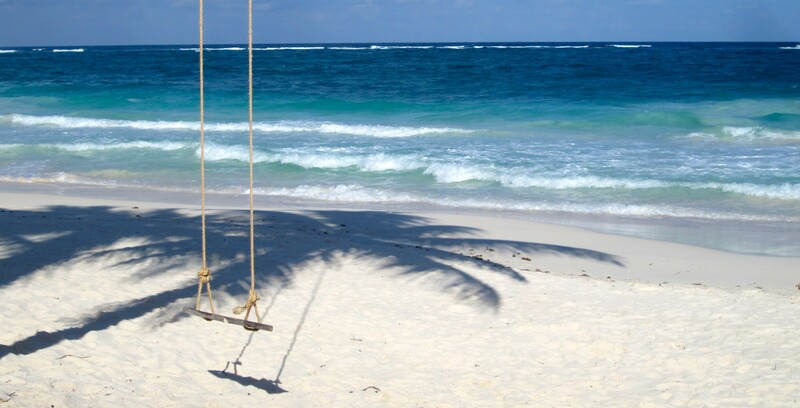 With its natural beauty, charismatic culture and atmosphere, it easily earns that distinction. Because of its sheltered coast and mild climate, there’s a whole ecosystem going on here. Back in the room I gazed out on the harbor, thinking about Mowzer and Tom. That night we enjoyed dinner in a local pub, The Ship Inn, surrounded by locals. Fisherman hugged the brass rail, drinking amber lager or ale with thick beards of foam. We had cider, shared a bowl of Cornish mussels and sopped up every drop of the garlicky, white wine sauce with granary bread. I ordered the John Dory but I really wanted star-gazy pie, a traditional Cornish dish made with pilchards, eggs and potatoes but it wasn’t on the menu that night. It’s baked in a pie dish, with fish heads and tails popping out the pastry crust, just like in the book. Each year on December 23 Mousehole welcome locals and visitors to celebrate Tom Bawcock’s Eve. 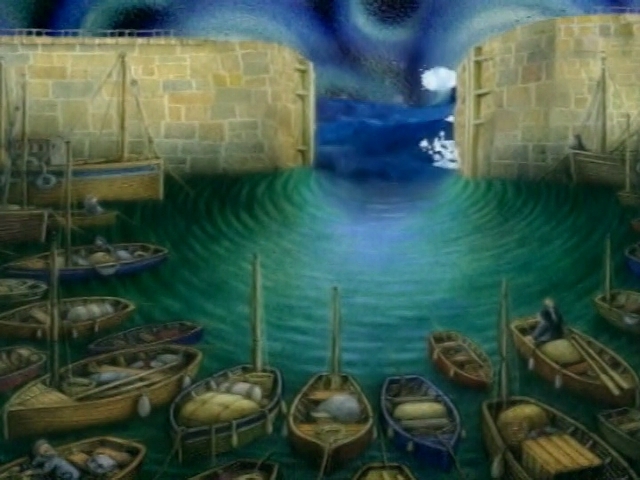 The festival is a celebration of this legendary Mousehole fisherman who risked his life during a severe storm to end the famine that had come to the town. The festivities include a lantern procession and lots of star-gazy pie. 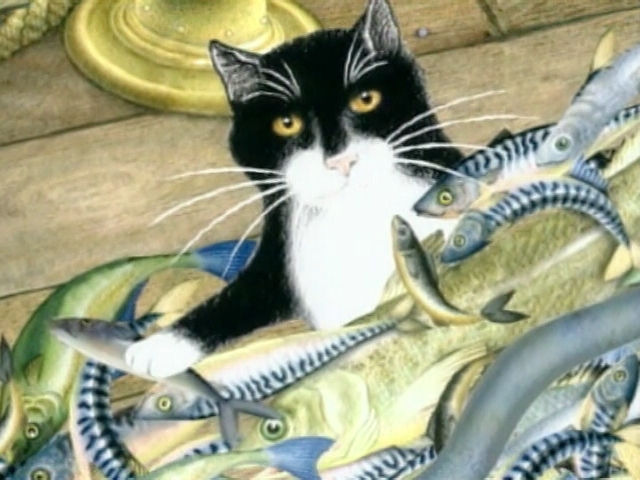 Antonia Barber, inspired by the legend and the tradition, made Tom more famous when she wrote The Mousehole Cat and partnered with Nicola Bayley who created the fine and imaginative illustration. 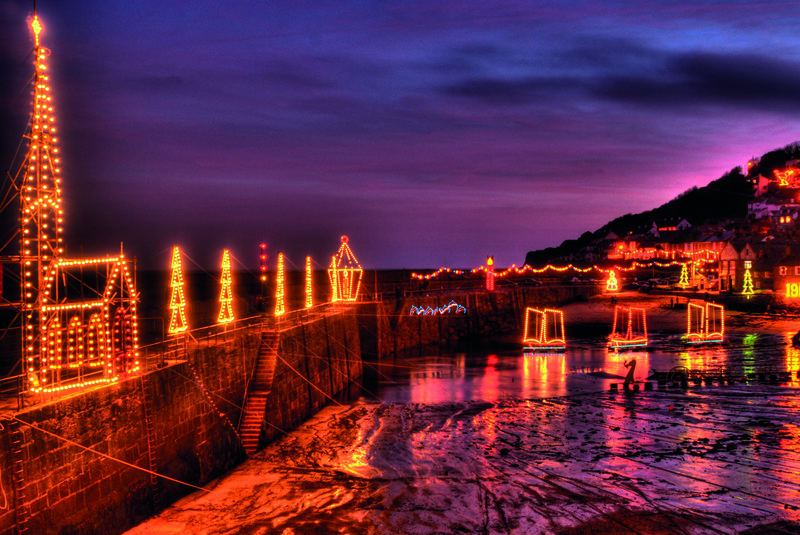 This year, Mousehole celebrates its 50th anniversary of Christmas illuminations. This little town puts on one of England’s most spectacular displays that lights up the harbor, raises money for charity and draw people far and wide. The celebrations kicked off this past Saturday and will run to January 4. We traveled by car from London to Mousehole. The trip took about four hours and we stopped along the way for treats. I almost caused an accident when my guy said, “There’s Stonehenge” and in my excitement slammed on the breaks and asked where? But come on, it’s not every day you see a historic druid monument just off a motorway. And I was driving on the wrong side of the road, on the road side of the car. After Mousehole we tripped along the Cornish coastline, drove through pretty towns along single lane roads tunneled by hedges so high all you can see is the sky above you. 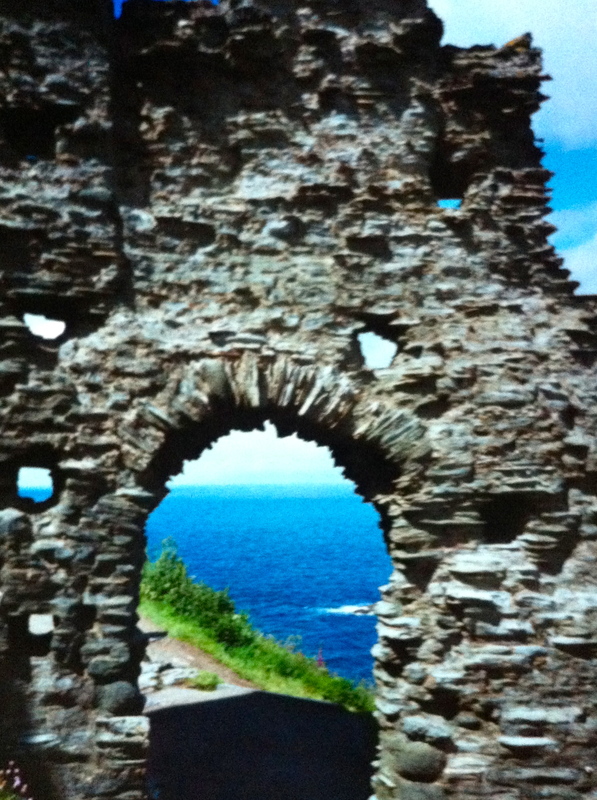 We passed through Land’s End and visited the ruins of Tintagel Castle, where Merlin’s Cave is said to lay beneath along sparkling, cobalt blue water. My visit was a treasure and as much as I’d like to be in Mousehole right now, I’m content with my own little tradition. I’ll curl up on the coach with a steaming cup of English tea and The Mousehole Cat. I may even take a crack at whipping up a star-gazy pie this year, although I may have to substitute the pilchards. This entry was posted in Claudia's Trips, Uncategorized and tagged Antonia Barber, Boscastle, Britain, car travel, cats, celebrations, Christmas, Christmas lights, Cornish pasties, Cornwall, cream and scones, England, family travel, festivities, fishing village, illuminations, inspired travel, John Dory, London, Merlin, Merlin's Cave, Mousehole, Mousehole Cat, Nicola Bayley, rail travel, road tripping, seaside, star-gazy pie, The Mousehole Cat, Tintagel Castle, Tom Bawcock, transportation, Travel, Travel Agents, UK, United Kingdom on December 19, 2013 by portsarecalling.